When the lettuce has wilted and the broccoli is done, I'm especially grateful for peas. They're one of my favorite green vegetables because they give so much. Not only are they nutritious and adapt well to a bzillion recipes, but they do extra duty by improving the soil as they grow. Peas are one of the world's oldest crops. They were foraged in the wild long before they were "domesticated." Romans, however, believed fresh green peas were poisonous and had to be dried before they could be eaten. (Dried peas were the staple food of Napoleon's army). It wasn't until the time of King Louis XIV of France that a French gardener developed a green pea hybrid know as petits pois. French peas soon became all the rage at the king's court and they soon spread in popularity. There are basically two types of peas available for home gardening: shelling peas and edible pod peas. Shelling peas are grown for their round, sweet peas. These are the peas most familiar to consumers as they are frozen, canned and added to thousands of pre-fab meals. The difference between shelling peas and edible pod peas is that the shelling varieties have a hard, inedible membrane or "parchment" that lines the inside of the pod. Edible pod peas don't have this tough shell. Their pods are more tender. Thus, both the peas and its pod are meant to be eaten which means you get more for your money and effort! Edible podders do better than shelling peas in northern climates, which explains why they're a favorite among Canadian and Alaskan gardeners. They come in two types: Oriental or snow peas, and snap peas. The Oriental peas (also called sugar peas) are the stir-fry classic. They are generally flat, crispy and have thin, tender walls. These include Oregon Giant, Oregon Sugar Pod II and Dwarf Grey Sugar-an heirloom favorite of mine, because of their beautiful fuschia-purple flowers. Snap peas are the round pod type of edible pod peas. Their shells have thick walls. Snap peas are eaten either as young flat pods, or after the peas have grown and are fat and juicy in the pods. Varieties include Sugar Ann, Cascadia, and Sugar Snap. As edible pod peas mature, "strings" develop. These strings should be removed before eating. It's a simple task that you can do as you pick or later when working through the pile. Just start at the tip and strip toward the stem on the concave side, then over the top and down the convex side. Got it? (I might recommend to the International Olympic committee to include pea de-stringing as an Olympic event). Good news though: "stringless" varieties, such as Sugar Daddy, are now available. Pods are ready to pick about 3 weeks after the blossoms form. In most areas, flowers and pods will keep on developing right up to frost. The best thing to do is harvest daily to catch peas at their prime and to encourage vines to keep producing. Peas also taste best if you prepare and eat them right after harvesting-the sugar in peas turns to starch within a few hours after picking. Preserve any extras as soon as possible by canning, freezing or pickling. To freeze peas, pick and de-string them. Blanch them for a minute, then plunge them in cold water to cool. Drain, pack, and freeze them. To pickle them, just substitute edible pod peas for asparagus or other vegetable pickle recipe. Very yummy. After you're done harvesting peas for the season, don't just pull out the vines and toss them aside or even in the compost heap. Peas, like other members of the Leguminosae family, "fix" nitrogen in the nodules on their roots. Pull out any healthy pea or bean plant and you should find small pimples or nodules. It you were to cut these open and examine them with a microscope you would see bacteria. These bacteria live symbiotically with the plant. The plant feeds them with everything they need except nitrogen: the bacteria fix nitrogen from the air (combining it with oxygen to form nitrates), and this they use themselves and also feed to the host plant. So, at the end of the season, dig the plants into the soil while it is still lush and green. It will rot quickly and the nitrogen will be released into the soil. It's like a gift from the pea fairies! Edible pod peas are wonderful added to sandwiches (for extra crunch), salads, casseroles, cheese fondue, spaghetti sauces, stews and soups. (For stews and soups, add them at the last few minutes of cooking). While cooking the salmon, prepare the pea pods. In a skillet, melt butter, add peas and saute for a few minutes. Add sherry, brown sugar and ginger and stir thoroughly until snap peas are well covered with the sauce. Put cooked salmon on warm plate; spoon the contents of skillet over the fish steak. Garnish with mint or parsley, add lemon slices and serve immediately. Serves 4. So, pass the peas, please? 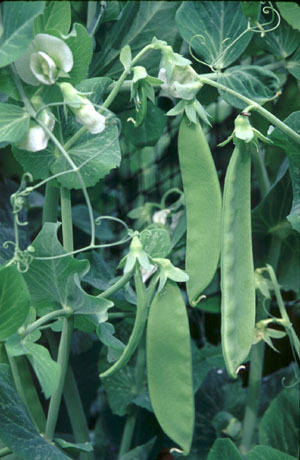 Photo Caption These Oregon Giant snow peas grow to 5 inches long and have a wonderful sweet flavor. The white blossoms are edible. Photo by Marion Owen.